What’s the Difference Between a Fireplace and a Fireplace Insert? 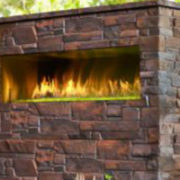 Fireplaces, also known as zero-clearance fireboxes, are a solution for those who are building a new home/new construction, have a space in their existing home where they’re like to ADD a new fireplace, and people who want to ADD a fireplace for their outdoor patio. 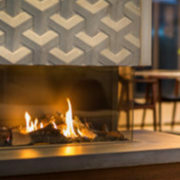 Fireplaces are ready to be installed into a framed wall, a cabinet bumped into your room, or a framed outdoor structure, and are available for wood, gas, or electric (pellet fuel is only available for freestanding stoves and insert). Fireplaces come in both open face and air-tight sealed units, and for gas, they can be either direct-vent (exhausts horizontally through the side of the house or through the roof) or vent-free (no vent required). For woodburning, the chimney system must run vertically past the highest point of the roof. So, what is a fireplace insert? 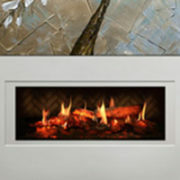 Essentially, it’s a self-contained unit that can ONLY BE INSTALLED INTO A WOODBURNING FIREPLACE. 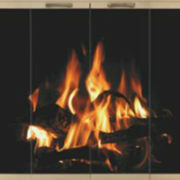 Fireplace inserts are designed to burn wood, gas, pellet or electric fuel types. 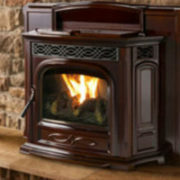 The major benefit to installing a fireplace insert is the increase in efficiency, where your fireplace opening is not “closed down” with the insert and your damper may be insulated to stop cold air from pouring down the chimney into your room- the fireplace inserts are designed to only provide heat into the room, not take it away and send it up the chimney. Pro Tip: Is a Gas Log a Fireplace Insert? : A “Gas Log” is not a fireplace insert, though they are commonly considered one in the same by the general public. 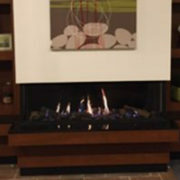 Gas logs replace the grate in your fireplace with a gas burner, and refractory logs are installed upon the burner. YOU MUST use the burner and logs designed and UL Listed by the same manufacturer. Some require a fully functional chimney for their exhaust, and some can be operated with the damper closed. 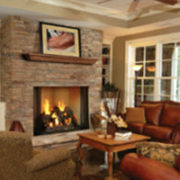 As one of the leading fireplace stores located in New Jersey, and as an Industry Recognized “Retailer Of the Year” finalist, you can be assured that we have the widest selection fireplaces and a fireplace inserts for you to choose from, and that our Expert Staff will work diligently to help you identify your needs, choose the correct product and add value to your home. To learn more about what some of the difference between a fireplace and a fireplace insert are, to find out which one will be most cost-effective for you, please give us a call, or fill out a contact form on our site.